For our third IR Assignment, we had to create a movie poster about the book we had read for that period of time. 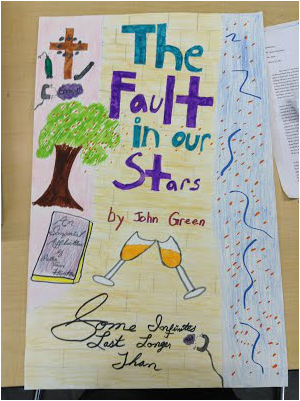 Our poster had to depict a theme, scene or symbol from our book, and had to use bright colors. The poster had to include the title of the novel, the author's name, a tagline that embodied the major theme or subject of the book, and it had to be on a 14x22 poster board. My novel was The Fault In Our Stars by John Green, and I incorporated many different aspects of the book on my movie poster. The main theme is of Amsterdam, when they're are walking around the city, and then go to dinner at the restaurant next to the river, where they drink Champagne, eat great food, and watch the orange pedals fall from the tress and flow in the water. I also put the gas tank, metal leg, and cross for the therapy group where they met in the top left corner. On either side of the poster I also put phones that have a voice saying "OK" through them, because that is there little thing. I made my tagline "Some infinites last longer than," and purposely didn't finish, so that I could incorporate both the book that they are both fascinated with, that ends in an unfinished sentence, and the fact that Augustus said that some infinites last longer than others in one slogan. Looking back on it, one major area of growth that is displayed is my thoroughness in the art. Before, I would not have colored in the background, and would not have put as many small illustrations on the poster because I am a terrible artist. Another huge area of growth that is shown here is that I was finally able to put a deeper meaning in something besides a piece of writing. Everything on this poster represents some different aspect of the book, and I am very proud of myself for being able to finally communicate something through drawings. Some potential areas of improvement that I could use for this assignment are my art skills; drawing, coloring and that sort of thing.